The Village and Civil Parish of Gowdall is currently within the boundary of the East Riding of Yorkshire located in close proximity with the boundaries of North Yorkshire and South Yorkshire. 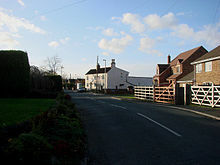 Previously the village was under the county authority of the West Riding of Yorkshire and North Humberside. The village boundaries are to the north, the River Aire; to the east, Pick Hill flood band extending over the railway crossing down Dorr Lane to Pontefract Road; to the south Pontefract Road and finally to the west the now disused Hull and Barnsley railway line and the current rail track taking trains to and from Drax Power Station up to the Iron Bridge crossing the River Aire. In total an areas of 1100 acres. The settlement of Gowdall, mainly alluvial marshland, was not mentioned in the Domesday Book of 1086 though was thought to have come into being in the later twelfth century. The village of Gowdall took its name from the old English words “golde” and “halk” and means “the nook of land where marigolds grew”. Various ways of spelling have been recorded in historical references. 1226 – Goldhale; 1546 – Gowdale; 1598 – Gowldall and 1641 – the current designated name of Gowdall. Currently within the village there are 154 houses where 356 people reside. “The nook of land where marigolds grew”. © Gowdall Parish Council. All Rights Reserved. Design by Vision ICT Ltd.